Quiz night, every Tuesday evening from 8pm! Brought to you by our very own Quiz Master David. General knowledge questions for all ages as well as topical bonus rounds every week. 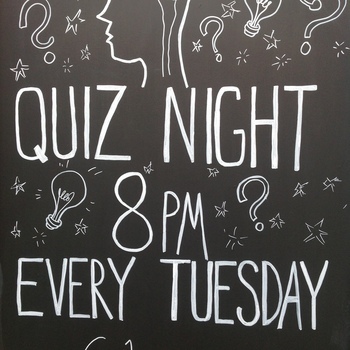 Come down Tuesday nights, test your general knowledge, and have fun while enjoying a pint of beer or glass of wine! £1.00 per person, the winning team takes the pot at the end of the night! HALLOWEEN QUIZ TUESDAY 30th - Winning team not only receive the money pot but also a free bottle of Prosecco for a future visit!